Not much writing today due to time constraints, plenty of pictures! One side removed to create five sided resist. Fiddly to lay out at the top and bottom of the stitching. I removed the resist from the bottom centre. 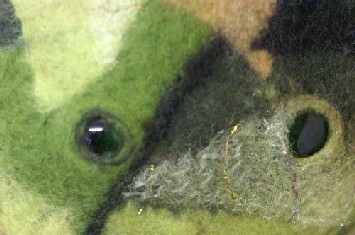 This demonstrates why the stitching needs to be secure, you don’t want the resist to have disintegrated by this stage! 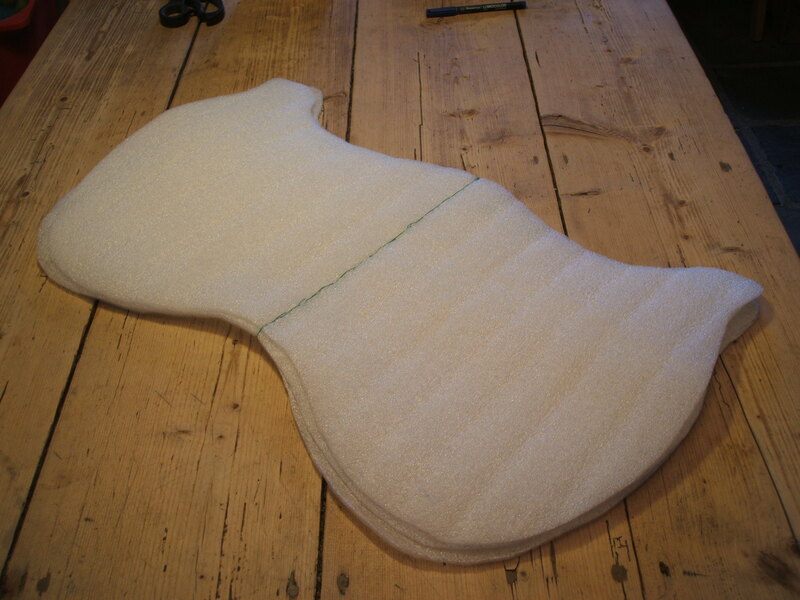 Now for the hard work fulling and shaping the felt! More pictures to follow in the next post! Yesterday I started working on my first larger sculpture of 2010. As mentioned before I have planned various shapes and sizes over the last few weeks but luckily I didn’t have enough laminate underlay (to use as a resist) to start working on something particularly big yesterday! I decided to work on a modified shape born out of the sculpture I made last summer in Denmark and set to making the resist and weighing out the wool. For the type of work that I wanted to create a symmetrical resist shape is best. 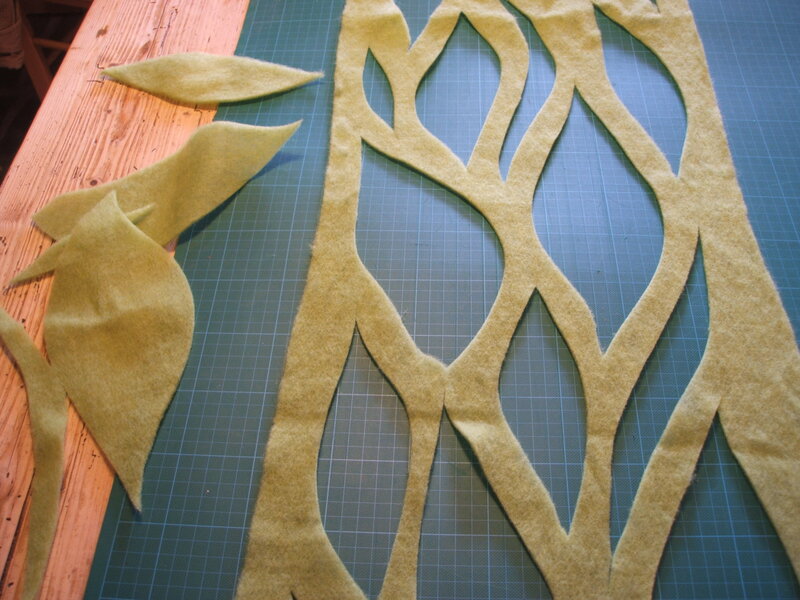 You cut your shape several times and then stitch the various layers together down the middle line using strong thread. For arguments sake just imagine three circles stitched together down the diameter, if you fanned the resulting semicircles out you would have six sides to create your sculpture with. Next you prepare six dry circles of wool weighing each layer to ensure the felt will be even, then you start laying and wetting your wool flipping the semicircles as you go until all the various surfaces are totally encased. For my piece yesterday I worked on a modified figure of eight lying sideways, the curves on the bottom edge were a bit extended and there was a small protrusion on the outside top edge. It took me a while to prepare the stitched resist and as I was working I decided to remove one of the ‘leaves’ to leave me with a five sided template. 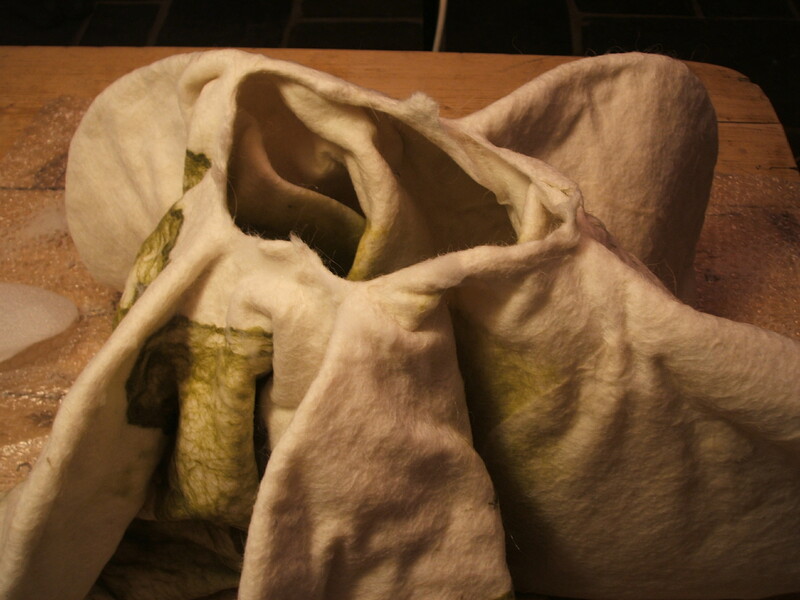 I decided to use natural white and apple green Icelandic wool with some green and white silk hankies and throwsters waste to add detail and surface interest. It took several hours to get the resist stitched and the five layers of wool prepared and dry felted lightly to help the fibres come together, these were then stacked like pancakes in preparation for covering the resist and wetting out the wool. To be continued …….. with some pictures! I have had several enquiries about the possibility of participants coming for only one day of the complex bag workshop and not both. As there are still spaces available on either day I have decided to throw it open and accept people for either Saturday 6th or Sunday 7th February if they so wish. Obviously because the bags are complex it will not be possible to plan and complete your bag in just one day but it would be possible to plan, design and get the bag to a stage where you could take it home with you to finish at your leisure. If anyone would like to take me up on this option please either ring me or email asap, I would really like to get everything sorted out before I head to Mullingar this weekend for my felting workshop with Anna. Patsy the plumber was here again this morning and the bad news is that I won’t have my own water supply for another couple of days although he has rigged me temporarily from a tap in my neighbour’s yard. The heat is back in action however and I have been able to run the washing machine at last and fill the water tank in the attic which is a big relief as I can have a bath again this evening! I can also get back to felting now with a vengeance and although the day is flying by with things to catch up on I hope to make a nuno scarf later in the afternoon and then get stuck into my new large felt sculpture tomorrow. Agh, now my heat has gone this morning so no water at all plus no heat today = no felting until services resume on Tuesday with the planned arrival of the plumber yet again! I did manage to carry up enough water from my neighbours yesterday morning to use in the experimental nuno felting workshop (all went well) but have decided to put some time into planning a LARGE felt sculpture over the next two days and not drag tonnes of water up the hill and wear myself out with all the effort!! For this large sculptural piece I am going to expand on the technique I learnt from amazing Icelandic felter Anna Gunnarsdottier at the large felt sculpture workshop I attended last July at the Felt in Focus Symposium in Denmark. As you can see, the small green and maroon sculpture which I made just after Christmas is three sided and by using Anna’s technique of multiple resists stitched together it is possible to get huge finished pieces with multiple sides, the only limit is how large you can visualise the finished sculpture to be! I want to make a submission for Sculpture in Context again and also work towards something unusual and creative for the Annual RDS Crafts Competition (Royal Dublin Society). Anna also showed us how it was possible to mend and repair our three dimensional pieces anywhere they were weak, this has opened up loads of avenues because she really appeared to ‘rescue’ work which previously I would have thought was totally beyond redemption. By applying this repair technique it means that I can be much more adventures with my shapes than I otherwise might have been so over the next few days I want to plot, plan and challenge myself in preparation for Tuesdays resumption of services and my first large felt sculpture of 2010! Yesterday morning was extremely wet and windy, this morning was lovely and bright with wisps of mist on the mountains, neither were great for trying to take any sort of photo with a small digital camera. However, I know from your comments that at least several of you are looking forward to some shots of the nuno felted wrap (which might actually become a banner) so here goes and please bear with me and the quality of the images! 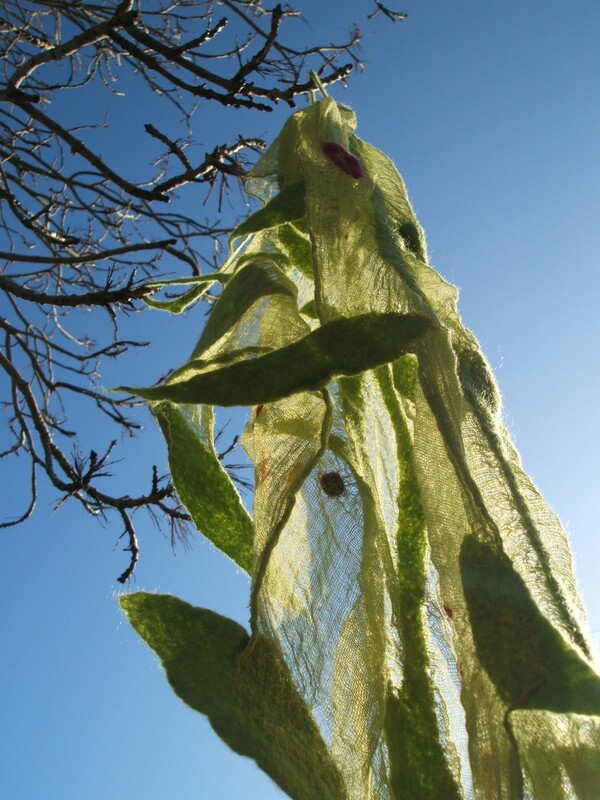 Firstly I had difficulty finding a suitable branch to hang the felt from especially since the sun and shade was so strong and I was trying to get as clear a shot as possible. Eventually I decided to just do my best and not worry unduly that the felt is kind of draped and the design is probably not the easiest to see, I’m sure you all get the picture! Note to myself, scrap the leaves at the edges if repeating this experiment as I am not sure that they really add anything to the finished nuno felt at all. 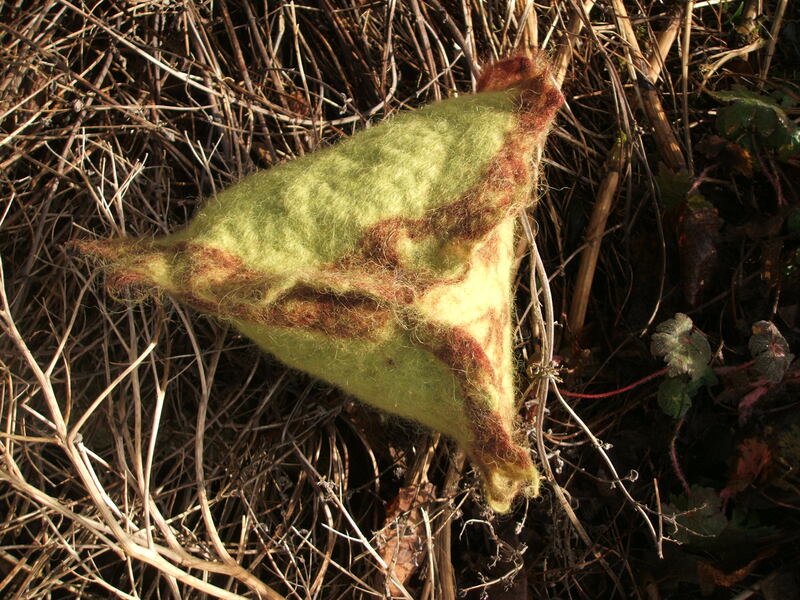 I love the open texture of the gauze after all my felting and rolling and you can see in this image a ‘leaf’ on the left hand side which was laid out on this side while the main piece of needle felt from which I cut the design out is actually felted through the gauze from the other side. This gives a nice bubbly effect to the surface and in fact if I was going to make another piece like this I would only lay my design on one side of the gauze and I wouldn’t add any of the loose ‘leaves’ to the sides either but possibly try some other kind of edging. At the time I thought that they were a good idea (obviously!) but on reflection they are only a distraction if you want to wear the wrap and don’t do a huge amount if you hang the nuno like a light felt banner. I do have a couple more pictures on Flickr but if the light is better over the next couple of days I may try and photograph the wrap again this time in it’s entirity. No water again! I don’t know what is wrong this time because all seemed to be running smoothly when the plumber left on Wednesday. However, after one long bath, two machine washes and loads of washing up all in the space of a couple of hours this morning no water came out of either tap and I did want to have everywhere nice and clean for tomorrow morning’s nuno felt workshop. At this stage I am not going to fuss about it as luckily I do have my heat but I will just have to walk down the lane later today and collect some water to heat up for out felting experiments tomorrow. Unfortunately I gave my mother her large double handled bucket back yesterday morning so small washing up bowls and lots of trips are all that I can see once more on the horizon! Speaking of water have you ever shrunk your favourite jumper in the washing machine by mistake? If so check out Clasheen Uncut where I go through the 20 minute process (I kid you not) of upcycling an old jumper and turning it into an eco chic and practical shopping bag! Weather permitting I will take some photos tomorrow morning of the nuno felt wrap I made recently using cotton gauze as the fabric and some commercially produced needle punched merino as the wool. This was another experiment I tried out at the start of my water difficulties and although the needle punched sheet was merino and the end result does look very pretty it does not appear to be as soft against the skin as my usual merino fibres would be. From a design perspective it did work quite well however. I laid the needle felt on my cutting mat and with a rotary cutter sliced out my design. I wanted it to be reminiscent of foliage and removed leaf shaped pieces which I then added to the reverse of the gauze at both ends and in selected places along the side. 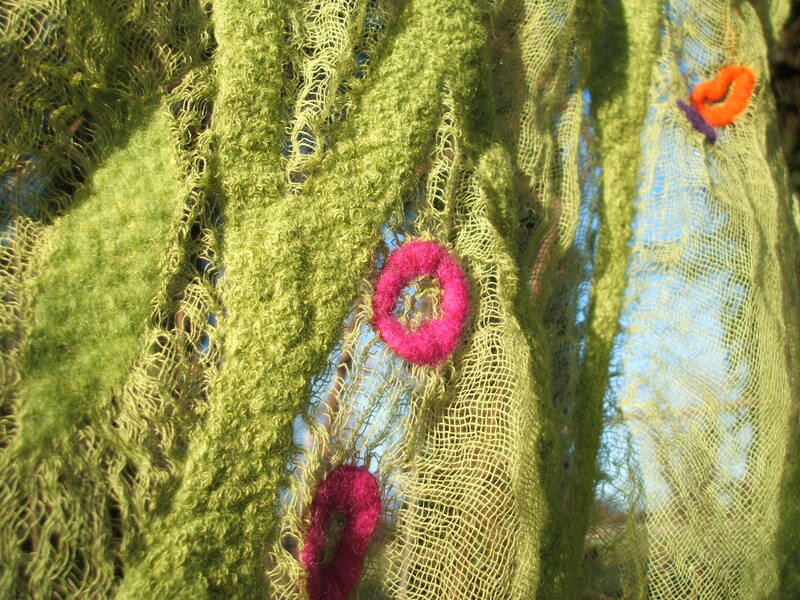 The cotton gauze that I was using was a gorgeous apple green and I decided to add small oval shapes in several places formed from hot orange, pink and plum coloured merino. Actually felting the wrap took AGES! The lay out was quick enough but the time saved by using the needle felt was totally eaten up and overshot by the length of rubbing and rolling I had to do to get the fibres to migrate through the gauze. 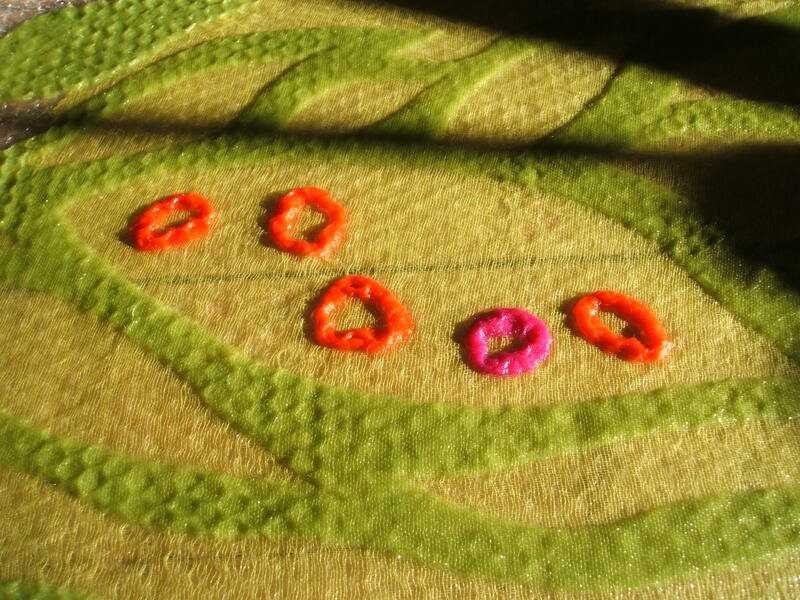 The ovals of fibre needed a huge amount of rubbing but this was probably because I almost dry felted them in my hands before laying them out on the gauze. 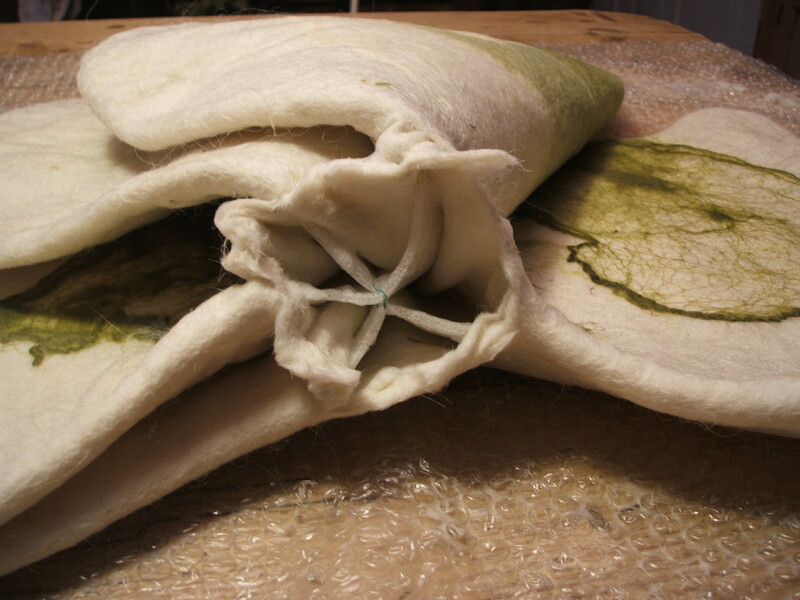 Eventually however everything came together nicely and after a couple of hours rolling the wrap was felted and finished. 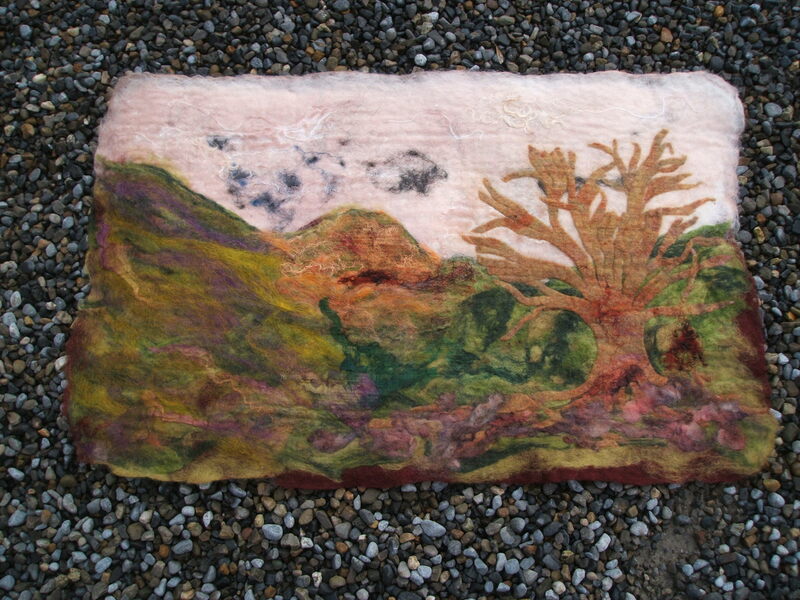 When I take the photos you will see how nice this nuno felted piece looks against the light. In actual fact I think that with a little bit of adjusting it would make a beautiful panel to hang from the trees although with our ongoing weather conditions here in Ireland maybe that would not be the most practical option! Don’t forget that if you live anywhere within striking distance of me and would like to experiment making nuno felt I have a 2 hour workshop on at Clasheen, Borris, Co. Carlow this coming Saturday morning! Please contact me asap to reserve your place. 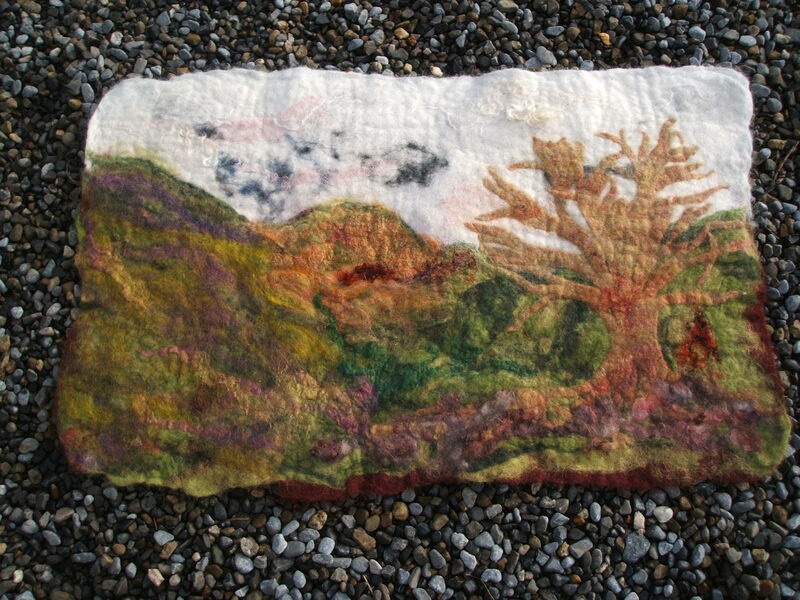 Large experimental landscape felted at last! Yesterday I was able to finish the large felt landscape that I had started at the beginning of the adverse weather conditions recently. You may remember that I had been playing around laying out loads of different fibres and broken up pieces of cobweb felt for my design, it had been languishing for the last couple of weeks damp in my bath! 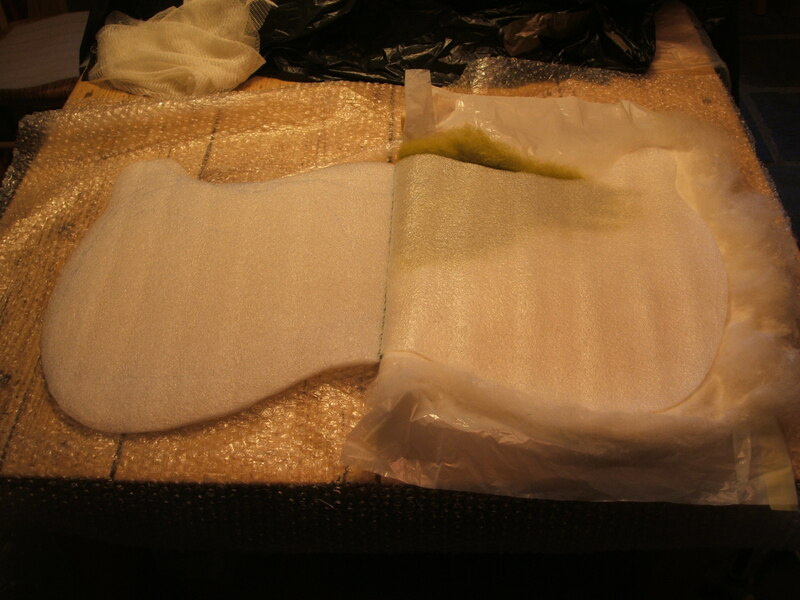 Anyway, here is a photo o f the piece yesterday morning before I got down to re-wetting and fulling the felt. At this stage it measured approx 85cm X 49cm and you can see that the sky area looks slightly pinkish. I boiled up a couple of kettles (STILL no heat or hot water!) and immersed the felt into a basin of hot soapy water. It took a bit of dunking and squishing before the fibres totally absorbed the water but once I was sure everything was saturated I soaped heavily and then rolled the piece firmly using my old bamboo blind. Because I was aiming for a nice textured surface and didn’t want too even a surface I didn’t roll for too long, just enough to totally felt the piece and once finished the completed landscape now measures 77cm X 49cm. As you can see from this picture of the finished landscape the sky now is white with grey wisps for clouds and extremely pale pink strands of gauze streaking it in places. It is hard to describe how like the mountains surrounding me these colours actually are. Where my farmhouse is situated at Clasheen the Blackstairs Mountains almost enclose me and every morning I am woken up to an ever changing view for inspiration! The finished landscape is now ready for a new home! To me it is completed as it is and would be a wonderful reminder of Ireland for a special friend. I do think however that if there are any needle felters, embellishers or stitchers out there it would also make an amazing base to work your magic on!! 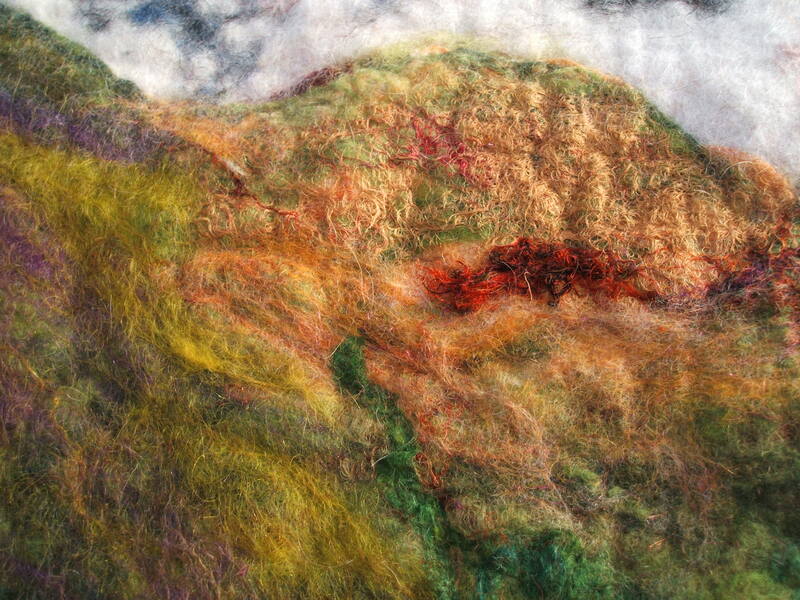 I am going to put the landscape up for sale in my Etsy store as soon as I have had a coffee (internet connection permitting) and am happy to include some extra fibres if anyone would like to play around and embellish the surface some more.